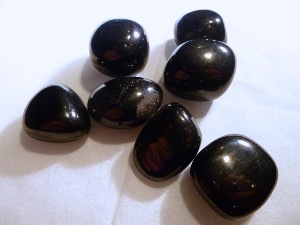 Jet is a black or dark brown variety of coal called lignite. It is a combination of carbon plus hydrocarbon compounds. Its name is believed to be derived from name of the town and river Gagas in ancient Turkey, where it or a similar material was found. Jet was formed by the lithification of submerged driftwood in sea-floor mud. The northeast coast of England has long been the source of the world’s finest Jet, but it has also been found in the United States, Poland, France, Germany, Spain, India, and Russia. Jet jewellery was produced in Britain as long as 1500 B.C., and the ancient Romans imported Jet jewellery made in York. Jet carving were used as talismans and for mourning in fourteenth- and fifteenth-century Spain. Native Americans from Alaska to South America used Jet as decoration in pre-Columbian times. In Victorian England, Jet was widely used in mourning jewellery, rosaries, crosses and carvings.